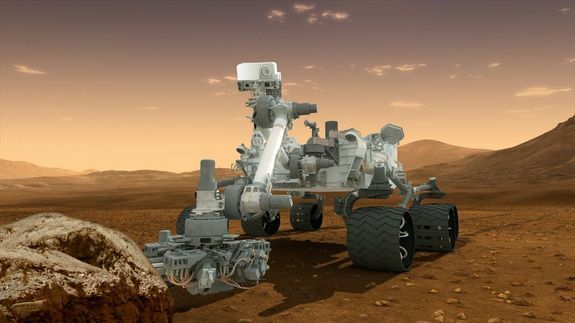 NASA’s Mars Science Laboratory (MSL) rover Curiosity has taken a further step along the way to retrieving and analysing samples gathered by its drill mechanism, which hasn’t been actively used since December 2016, after problems were encountered with the drill feed mechanism. 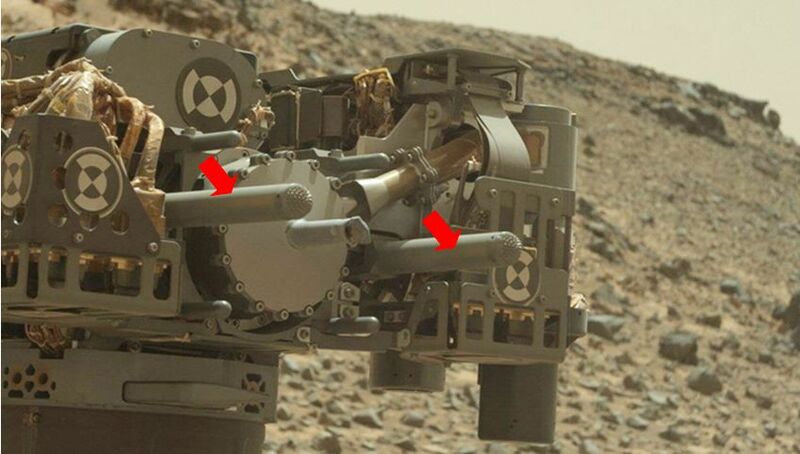 Essentially, the drill system is mounted on Curiosity’s robot arm and uses two “contact posts”, one either side of the drill bit, to steady it against the target rock. A motor – the drill feed mechanism – is then used to advance the drill head between the contact posts, bringing the drill bit into contact with the rock to be drilled, and then provide the force required to drive the drill bit into the rock. However, issues were noted with this feed mechanism, during drilling operations in late 2016, leading to fears that it could fail at some point, leaving Curiosity without the means to extend the drill head, and thus unable to gather samples. To overcome this, MSL engineers have been looking at ways in which the feed mechanism need not be used – such as by keeping the drill head in an extended position. This is actually harder than it sounds, because the drill mechanism – and the rover as a whole – isn’t designed to work that way. Without the contact posts, there was no guarantee the drill bit would remain in steady, straight contact with a target rock, raising fears it could become stuck or even break. Further, without the forward force of the drill feed mechanism, there was no way to provide any measured force to gently push the drill bit into a rock – the rover’s arm simply isn’t designed for such delicate work. So, for the larger part of 2017, engineers worked on Curiosity’s Earth-based twin, re-writing the drill software, carrying out tests and working their way to a point where the drill could be operated by the test rover on a “freehand” basis. At the same time, code was written and tested to allow force sensors within the rover’s robot arm – designed to detect heavy jolts, rather than provide delicate feedback data – to ensure gentle and uniform pressure could be applied during a drilling operation and also monitor vibration and other feedback which might indicate the drill bit might be in difficulty, and thus stop drilling operations before damage occurs. At the end of February 2018, the new technique was put to the test on Mars. Curiosity is currently exploring a part of “Mount Sharp” dubbed “Vera Rubin Ridge”, and within the area being studied, the science team identified a relatively flat area of rock they dubbed “Lake Orcadie”, and which was deemed a suitable location for an initial “freehand” drilling test. The rover’s arm was extended over the rock and rotated to gently bring the extended drill head in contact with the target, before a hole roughly one centimetre deep was cut into the rock. This was not enough to gather any samples, but it was sufficient to gauge how well robot arm and drill functioned. 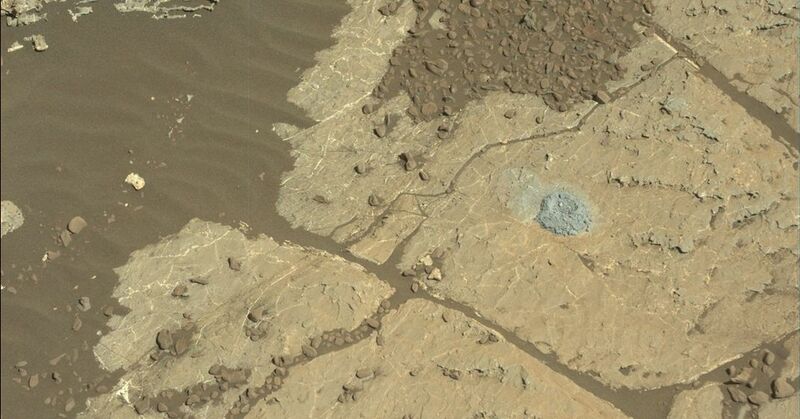 The test is only the first step to restoring Curiosity’s ability to gather pristine samples of Martian rocks, however. The next test will be to drive the drill bit much deeper – possibly deep enough (around 5 cm / 2 inches) to gather a sample. If this is successful, then the step after that will be to test a new technique for delivering a gathered sample to its on-board science suite. Prior to the drill feed mechanism issue, samples were initially graded and sorted within the drill mechanism using a series of sieves called CHIMRA – Collection and Handling for In-Situ Martian Rock Analysis, prior to the graded material between deposited in the rover’s science suite using its sample scoop. This “sieving” of a sample was done by upending the drill and then rapidly “shaking” it using the feed mechanism, forcing the sample into CHIMRA. However, as engineers can no longer rely on the drill feed mechanism, another method to transfer samples to the rover’s science suite has had to be developed. This involves placing the drill bit directly over the science suite sample ports, then gently tapping it against the sides of the ports to encourage the gathered sample to slide back down the drill bit and into the ports. This tapping has been successfully tested on Earth – but as the Curiosity team note, Earth’s atmosphere and gravity are very different from that of Mars. So whether rock powder will behave there as it has here on Earth remains a further critical test for Curiosity’s sample-gathering abilities. 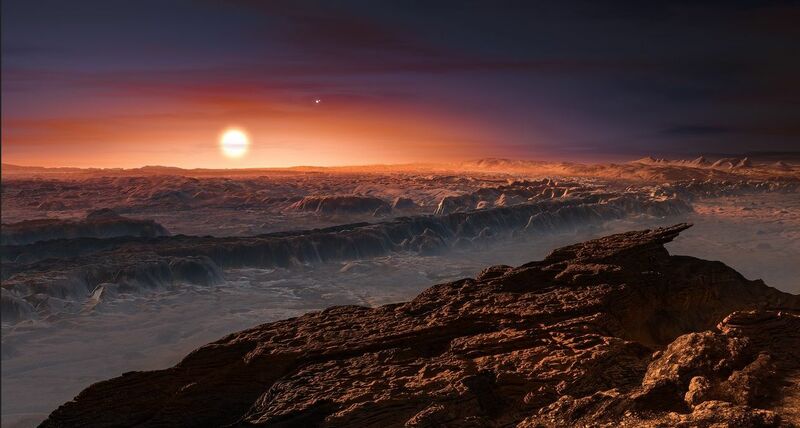 Since the confirmation of its discovery in August 2016, there has been much speculation on the nature of conditions which may exist on Proxima b, the Earth-sized world orbiting our nearest stellar neighbour, Proxima Centauri, 4.25 light years away from the Sun. Although the planet – roughly 1.3 times the mass of Earth – orbits its parent star at a distance of roughly 7.5 million km (4.7 million miles), placing it within the so-called “goldilocks zone” in which conditions might be “just right” for life to gain a foothold on a world, evidence has been mounting that Proxima b is unlikely to support life. The major cause for this conclusion is that Proxima Centauri is a M-type red dwarf star, roughly one-seventh the diameter of our Sun, or just 1.5 times bigger than Jupiter. Such stars are volatile in nature and prone stellar flares. Given the proximity of Proxima-B its parent, it is entirely possible such flares could at least heavily irradiate the planet’s surface, if not rip away its atmosphere completely. This was the conclusion drawn in 2017 study by a team from NASA’s Goodard Space Centre (see here for more). Now another study adds further weight to the idea that Proxima b is most likely a barren world. In Detection of a Millimeter Flare from Proxima Centauri, a team of astronomers using the ALMA Observatory report that a review of data gathered by ALMA whilst observing Proxima Centauri between January 21st to April 25th, 2017, reveals the star experienced a massive flare event. At its peak, the event of March 24th, 2017, was 1000 times brighter than the “normal” levels of emissions for the star, for a period of ten seconds. To put that in perspective, that’s a flare ten times larger than our Sun’s brightest flares at similar wavelengths. While the ALMA team acknowledge such ferocious outbursts from Proxima Centauri might be rare, they also point out that such outbursts could still occur with a frequency that, when combined with smaller flare events by the star, could be sufficient enough to have stripped the planet’s atmosphere away over the aeons. Which is a bit of a downer for those hoping some form of extra-solar life, however basic, might be sitting in what is effectively our stellar back yard – but exoplanets are still continuing to surprise us, both with their frequency and the many ways in which they suggest evolutionary paths very different to that taken by the solar system. 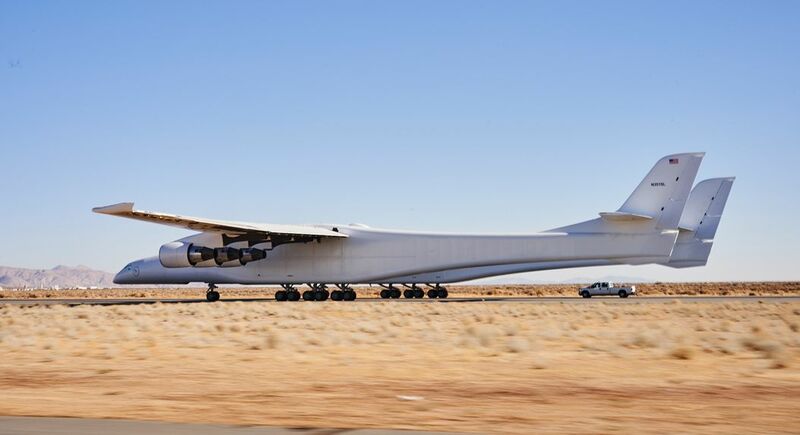 At the end of February 2018, Stratolaunch Systems, the airborne launch system company founded by ex-Microsoft co-founder Paul Allen, took a step closer to seeing its massive carrier aircraft, nicknamed the “Roc” (officially the Scaled Composites Model 351) take to the skies – an event planned for early 2019. “Roc” is classified – by wingspan – as the world’s largest aircraft, and the biggest all-composite plane ever built. Technically referred to as a “two hulled” aircraft, it is based on two Boeing 747 airliner hulls. These are linked by a main load-bearing wing measuring 117 meters (385 ft), wing tip to wing tip. It is powered by six turbofan engines of the type used to power airliners like the 747, 777 and Airbus A330. The aircraft was officially unveiled in May 2017, and since then has been undergoing a series of step-by-step tests to help evaluate and prepare it for its first flight. The most recent of these tests – on February 24th, 2018 – saw the gargantuan aircraft complete the fastest thus far of a series of taxi tests to evaluate its ground handling characteristics. The idea behind Stratolaunch Systems is to provide a relatively low-cost means of delivering satellites into low-Earth orbit. The carrier aircraft is designed to carry aloft rocket-powered launchers and payloads under the central “wing” structure connecting the two fuselage sections. Once at altitude, the payload launcher(s) can then be dropped horizontally and once safely clear of the aircraft, ignite their motors and carry their payload to orbit while the carrier aircraft returns to its base of operations. Air-launch systems like it are not new: at the dawn of the space age the United States used the approach when probing the upper limits of Earth’s denser atmosphere with the X-plane series, while since 1990, Orbital ATK has operated the Pegasus air-launched rocket to place small satellites in orbit. However, the approach is perhaps most noted as being the one adopted by Virgin Galactic, which uses a twin-hulled carrier aircraft (WhiteKnightTwo, also built by Scaled Composites) to haul its sub-orbital SpaceShipTwo rocket plane to altitude, prior to launch. Alongside “Roc”, Stratolaunch had planned to develop a large-scale, payload-carrying rocket – work initially contracted out to SpaceX. However, problems, re-thinks and other changes mean that initially, the “Roc” will likely carry multiple Pegasus XL launch vehicles to altitude on each flight, before releasing them in turn to allow them to carry their (roughly) half-tonne payloads to low Earth orbit. In 2014, Stratolaunch joined with Sierra Nevada Corporation (SNC) in a study evaluating whether “Roc” could be used as a launch vehicle for a crewed version of SNC’s Dream Chaser space plane. At the time, SNC had been rejected by NASA as a contender in the US agency’s commercial crew transportation project, and the company was looking at a range of options for continuing to develop a crewed vehicle. The join study with Stratolaunch proposed the use of a version of Dream Chaser capable of flying up to three people and a science payload to low Earth orbit, using a rocket system developed by Orbital ATK, builders of a Pegasus. Since that time, SNC have been awarded a NASA contract to fly an uncrewed version of Dream Chaser (Dream Chaser Cargo) on resupply missions to the ISS, so the development status of any crewed version of Dream Chaser remains unclear. Meanwhile, if all goes according to plan with Stratolaunch, “Roc” will take to the skies in 2019 to commence a series of flight tests which will, at some point involve carrying test payloads aloft, and working towards a first launch, which could occur in early 2020.